Though the Basic Warm-up is focused on Voice, this step could be used for a warm-up that's geared more specifically toward speech as well. Now that you have relaxed the jaw and tongue,and have sensitized the soft palate, it's now time to awaken your face, and your facial muscles. (Wikipedia lists 23 muscles of the face.) The face is covered with skin, and very sensitive it is. As actors, the face is sometimes called 'the money maker,' so naturally we want to take good care of our skin. First thing in the morning, your face can feel rather "dead," so we want to wake it up by massaging your face, and then activate the muscles of the face with a few isolation exercises. 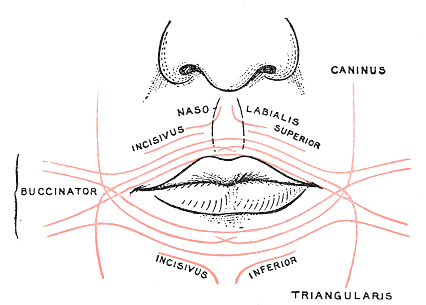 For more on facial muscles, visit my teaching website, The Voice + Speech Source. With gently rounded fingers, tap your scalp all over with the tips of your fingers. This should envigorate the scalp and encourage blood flow. Then with gentle, circular movements of the pads of the fingertips on the skin of your face, begin at the forehead and slowly move downward toward the eyebrows. At the brow, you'll want to move outwards to the temples, where you could change directions with your fingers a few times. 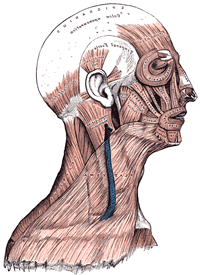 From here, press firmly with the fingertips and slide the hands down the sides of your face to the bottom corners of your jaw, dragging your fingers over the jaw (or masseter) muscles located here. Once you're pretty clear on where those jaw muscles are (you could find them very easily by biting in order to flex those muscles), go back to circling the fingertips on top of those muscles now that they're relaxed. From here, move the fingers up to the cheekbones and gently press your fingertips or thumbs into the boney edges of your eye sockets, working all the way around. When you get to the bridge of your nose, use the tips of your fingers to massage down your nose, making little circles as you go. When you get to bottom of your nose, put the flat of your fingers on your cheeks and move your whole cheek around in a circle. Next, move your fingers onto your upper lip, and then work your fingers down and around to your lower lip. Now grab your lower lip, pinching it between your thumb and index finger. You should be able to feel a small pea-sized structure in the centre, under the body of your lower lip where it attaches to your gums. Now, grab onto your upper lip and find a similar structure where that lip attaches to your upper gums. Finally, pinch the corners of your mouth between the thumb and index finger of both hands, making "duck lips." You should be able to feel a thickness in the corner of your lip, where the muscles of the upper lip criss-cross with the muscles of the lower lip. The final stage of our facial massage is to move into the chin area with circular movements of the fingertips. From here, slide the fingertips over the edge of the jaw and press gently but firmly into the underside of your jaw line, moving from the centre of your chin outward to the corners of your jaw. Now you can drag your fingertips down your neck to your larynx (where the adam's apple is on guys), and holding the larynx with your fingertips, gently press from side to side, causing your larynx to move from side to side. Now purse your lips into a tight kiss, projecting your lips forward. From there, stretch the corners of your lips wide toward a broad, flat smile. (Think of drawing the corners of your lips straight sideways toward your earlobes rather than bringing the corner of your lips up toward your cheekbones.) Now go back and forth between pursing and spreading, each time getting a little quicker in your movements.